Salon deZEN is a place for artists, creativity and collaboration with every person who walks through our doors. For me, walking in the door every day and flipping on the lights I'm practically destined to see something new, rearranged, repainted etc. part of this is the owner, Maria Elizabeth. Walking into the Salon you are bound to see her latest art projects hanging over the shampoo bowls or suspended mid air in the center of the stylist floor. She inspires creation and change in all of the staff here, and sometimes our clients and friends. Which brings us to the subject of this post, Hair Trends We Love. This year has been a bit of a whirl wind, a lot of things have inspired us to new heights with our makeup, hair and personal style, some of them were too exciting not to try, plus the stylists here love a challenge. We all want to be daring every once in a while and trying something new like a little pop of your favorite color in your bangs or peeking out from underneath your mane can give you that sweet taste of rebellion without going overboard. 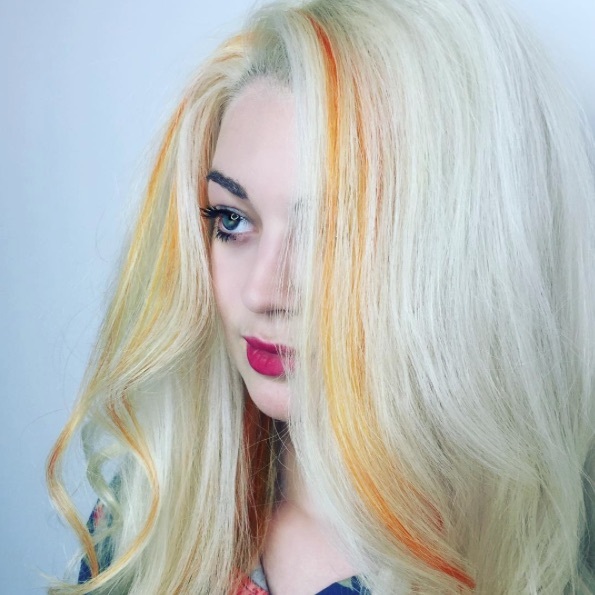 Take for instance this sweet pop of bright orange, it just adds a bit of zing to her gorgeous hair. This look is a little more bold and she pulls it off spectacularly. Even kids get in on the fun with a little hair chalk! Poets and Philosphers from times long past have looked up at the night sky and been inspired by the startling colors and infinite possibilities. And now Stylists are getting in on the cosmic action with mind blowing results. We dubbed this color Purple Nebula and we adore it. This Galactic blue gets me every time, and I watched it being applied! I'm sure like me, many of you have spent a glorious evening staring into the flames of a campfire or watching candlelight flicker, there is something so pretty as well as tantalizingly dangerous about a dancing flame. There's a bit of fire inside of every one of us, for some it makes sense to display it on the outside in a blazing fashion. This searing inferno of color just speaks to me. This is a slightly subtler look akin to glowing embers. Shadow roots give way to blazing red ends. If becoming a majestic Mermaid wasn't on your goals list it will be after you google pastel hair, while these lighter shades require slightly more upkeep, we think the results are well worth the effort. Just look at that shimmery pink. There's more where that came from, keep an eye out for part 2 of this post, and check out our Instagram. Did this inspire you? Check out the stylists who created your favorite looks on our team page or book a free consultation and let us collaborate with you! deZEN would like to share with you some products we love that will help you maintain your healthy hair glow.